Soluble in anhydrous ethanol, ether, benzene and chloroform. Stable, but decomposes in the presence of moisture. Incompatible with aqueous solutions, strong acids, strong oxidizing agents. Flammable. 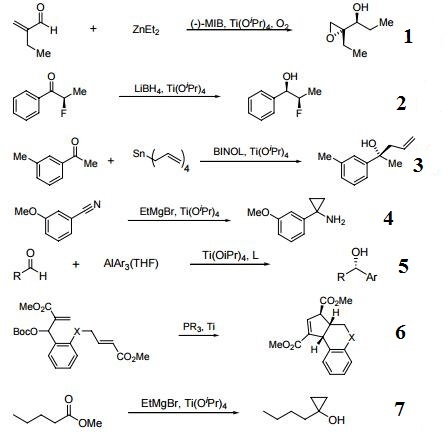 Catalyst for the synthesis of acyclic epoxy alcohols and allylic epoxy alcohols. Useful for diastereoselective reduction of alpha-fluoroketones. Catalyzes the asymmetric allylation of ketones. Reagent for the synthesis of cyclopropylamines from aryl and alkenyl nitriles. Useful for racemic and/or enantioselective addition of nucleophiles to aldehydes, ketones and imines. Catalytic intramolecular formal [3+2] cycloaddition. Catalyst especially for asymmetric induction in organic syntheses; in preparation of nanosized TiO2. Complexing agent in sol-gel process. A water-white to pale-yellow liquid with an odor like isopropyl alcohol. About the same density as water and . Flash point 66°F. Vapors heavier than air. Highly flammable. Fumes in air. Soluble in water. Decomposes rapidly in water to form flammable isopropyl alcohol. Metal alkyls, such as TETRAISOPROPYL TITANATE, are reducing agents and react rapidly and dangerously with oxygen and with other oxidizing agents, even weak ones. Thus, they are likely to ignite on contact with alcohols. 546-68-9 US $0.00 / kg 200kg 96% 1000MT Hefei TNJ Chemical Industry Co.,Ltd.